When we last caught up with Chef Miles Thompson last summer, he was helming his Vagrancy Project pop-up at Bill DiDonna and Charles Kelly's Allston Yacht Club in Echo Park, serving up the most ambitious food that the neighborhood had ever seen. 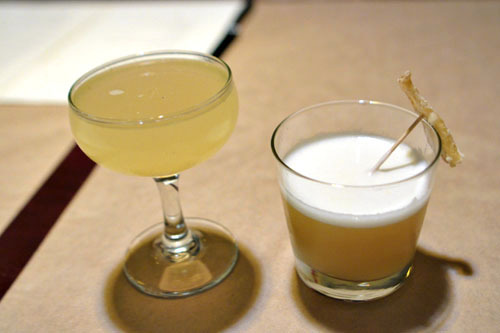 The experiment was largely a success, and owners DiDonna and Kelly decided to keep Thompson on and transform their place into the Chef's first solo effort: Allumette (French for "match," and also a matchstick-sized cut). 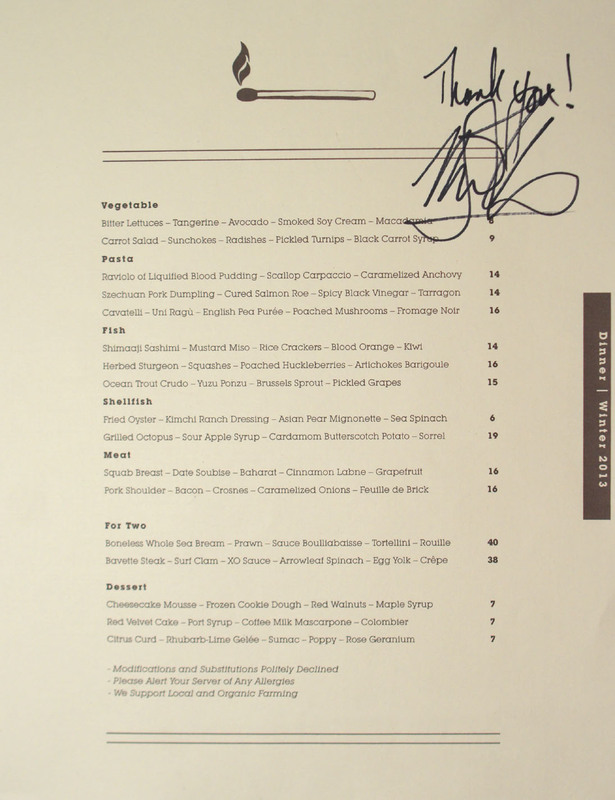 The revamped restaurant debuted on January 31st, and given my satisfaction with his cooking previously, a visit was certainly called for. As far as the interior goes, it hasn't changed all that much actually. It's a small, intimate space, set in tones of dark wood and red and with just a touch of Asian-y aesthetic. Allumette's menu features around 15 small items divided into various sections, and the idea is to create your own tasting menu by ordering four to five of them. Naturally though, we just ended up requesting one of everything (except the large format plates) and sharing. 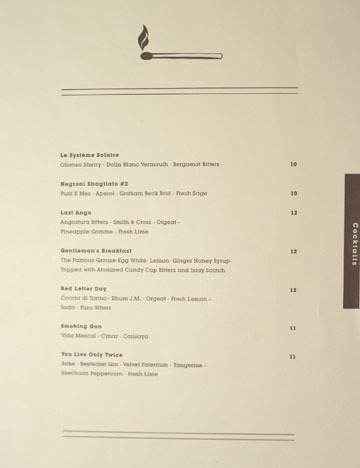 As for the tipple, the cocktails here are in the capable hands of Serena Herrick from Hollywood's famed Harvard & Stone, while the wine list is curated by co-owner Charles Kelly. Click for larger versions. We were in a cocktail-y sort of mood though, and were determined to make our way through all seven of Herrick's creations. First out the gate was the possibly James Bond-inspired You Live Only Twice, which I found clean and fresh, with a nice blast of sweet, citrus-y spice set off by the zesty kick of Sichuan pepper. On the other hand, the Gentleman's Breakfast was much heftier, displaying an intensely aromatic nose of smoky peat leading to some nice change-ups between bitter, sour, and boozy nuances, all enveloped by a trace of ginger. Thompson's bread and butter sort of rocked my world. What we had here was grilled focaccia accompanied by a fried butterball potato mash, with salt, Italian cheese, chive, and thyme. 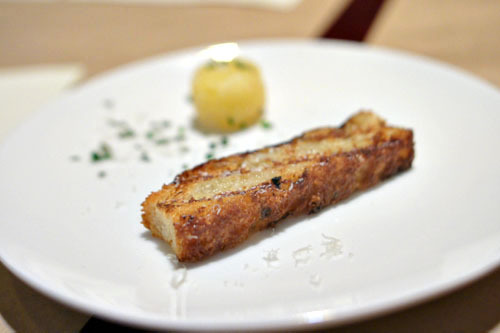 The bread itself was spot on, crisp and crunchy with a mouth-wateringly smoky, savory character, while the butter was even better, adding a pretty remarkable depth and lusciousness to the presentation. I've never had anything quite like it. 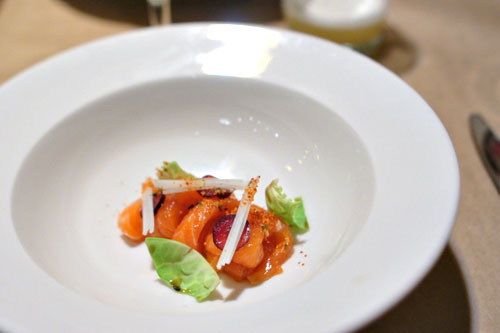 The meal got off to a strong start with a crudo of ocean trout. 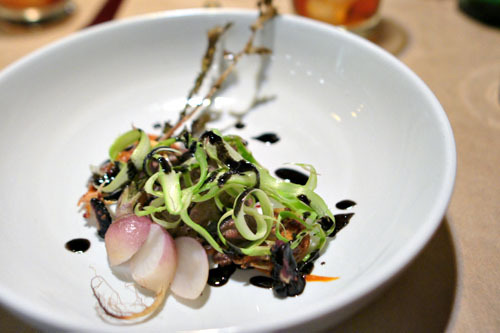 The fish had a lovely savor and punch to it, amped up even further by the use of ponzu. At the same time, I really appreciated the slight astringency and levity provided by the Brussels sprouts, and the subtle overtones of heat were stupendous, really putting a great finishing touch on the dish. 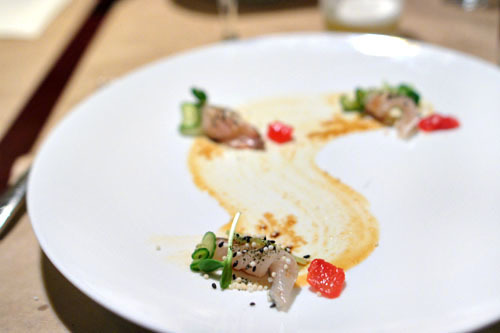 The striped jack was similarly tasty, with the clean, subdued fish taking on an additional complexity courtesy of the mustard-miso, while the fruit provided a nice touch of brightness, especially on the finish. I also loved the overarching heat imparted by the chilies here, and the crunch and savory kick of those rice crackers was spot on as well. Utterly balanced, with some wonderful flavor transitions. 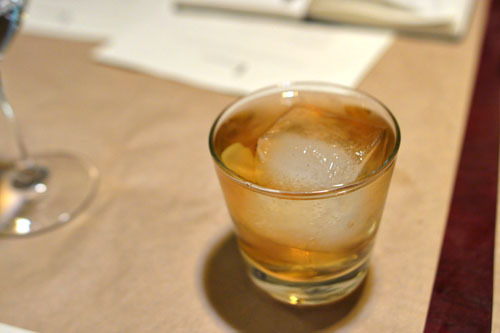 Our second round of cocktails brought us the Red Letter Day, a very light, somewhat tea-like drink with a refreshing interplay of bittersweet and citrus flavors all over a subtle undercurrent of Cocchi complexity. The Last Ango, meanwhile, made me think of Matt Biancaniello's legendary Last Tango in Modena, though there wasn't much similar except the name. It was one of my favorites though, with a fantastic nose of sugary spice moving toward a blend of bitter, sweet, and boozy notes on the palate. I'm confident in deeming this the best fried oyster I've ever eaten. Indeed, the oyster itself was perfect: wonderfully crunchy and hearty on the outside, yet still creamy and briny within. It would've been just fine alone, but the kimchi ranch was genius, adding a tanginess, funk, and richness that complemented the bivalve in stellar fashion. If that wasn't enough, the pear added a fantastic crunch and juiciness that took the dish to an even higher level. A must try. 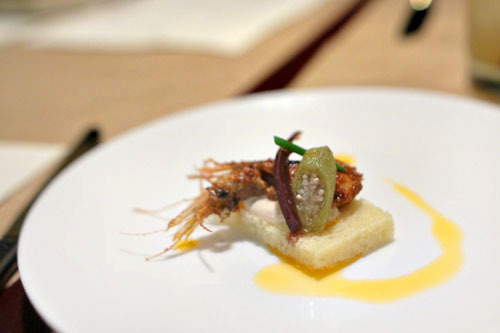 The second "bread" course was sort of an ode to American Southern cuisine, and featured a rectangle of brioche, topped with baby shrimp, okra, Angostura remoulade, and shrimp oil. There was a great depth to the bite, with the shrimp conveying a lingering hit of spice and savor that melded seamlessly with the remoulade, all while the brioche served as a light, slightly sweet base to the dish. Thompson did a great job with his sturgeon, giving it an immensely satisfying savoriness and salinity, along with a wonderfully firm, springy texture. 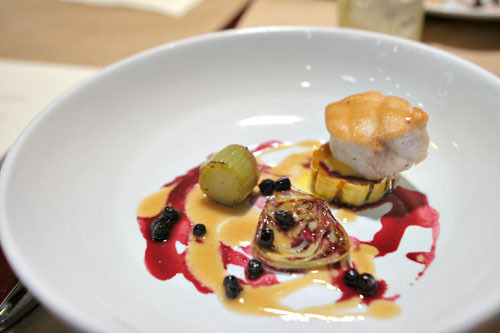 It was delicious alone, but I also liked the use of artichoke as a counterpoint, and surprisingly, the sweetness of the berries and squash worked here, not overwhelming things at all, but instead making for an intriguing foil to the fish. The octopus was for sure one of the more adventurous preparations that I'd seen in a while. It was expertly cooked: supple and tender, yet with a good bite, along with a slightly sweet, slightly salty taste all joined by a light touch of char astringency. 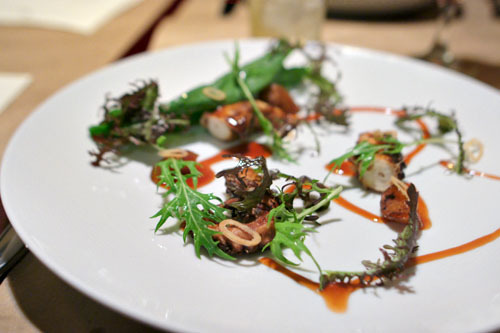 The interesting thing here was the amalgam of sour and spicy flavors that somehow managed to work with octopus, all underneath overtones of zesty sorrel. More cocktails. This time we had the Smoking Gun, which I rather enjoyed with its in-your-face smokiness up front and bittersweet midpalate, all leading toward a lingering, sweet finish from that Maraschino cherry. 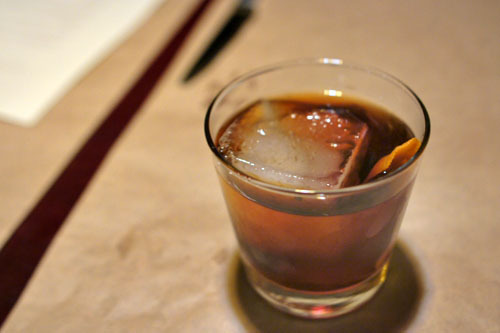 The Negroni Sbagliato #2 is a variation on the classic drink wherein the gin is replaced with sparkling wine. Personally, I found it even better than the original given the effervescence imparted by the South African sparkler, all combined with traditional flavors from the vermouth and Aperol. The cavatelli was divine, some of the best I've had in fact. I adored the firm, al dente texture on the pasta, and how it soaked up all the goodness from the uni, cheese, and white chocolate(? 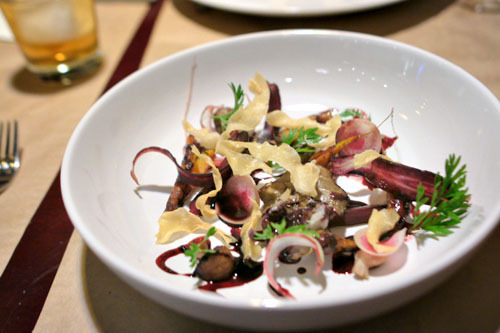 ), all while the mushrooms contributed a well-placed earthiness and weight to the dish. 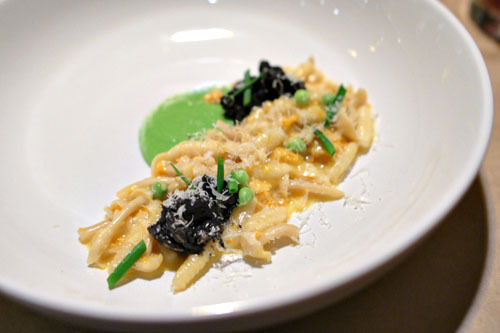 The pea, meanwhile, was crucial as well, adding a bright, verdant pop to the course that really provided a perfect counterpoint to the pasta. 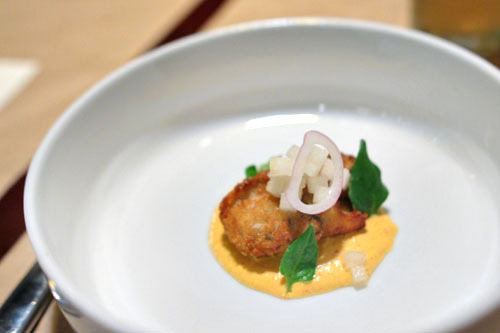 Next, Thompson riffed on the classic shumai with his version of the pork dumplings. 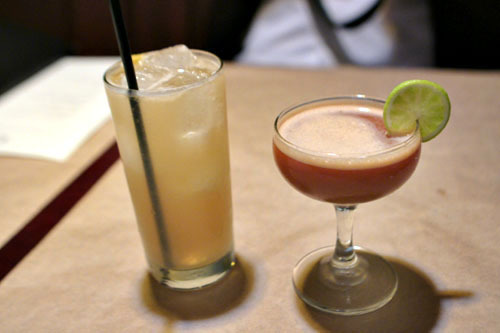 They were delicious, showing off some satisfyingly deep, dark, porcine flavors accented by a focused, vinegar-y tang. The greens, thus, were key in providing a sense of balance to the dish, and I appreciated the pricks of saltiness from the salmon roe as well. And now we come to the most potentially polarizing dish on the menu, so order carefully. Blood pudding can be sort of an acquired taste, and Thompson's ravioli conveyed all the earthy, heady, metallic flavors that you'd expect from it. 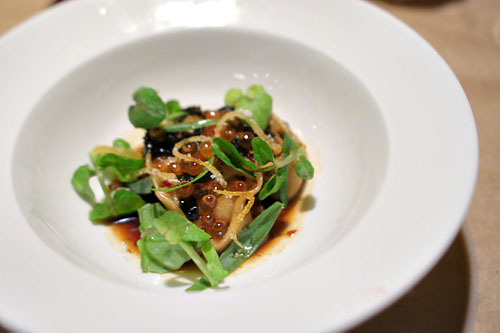 It was pretty intense, so the scallop was key in moderating the dish, and also provided for some textural variation. 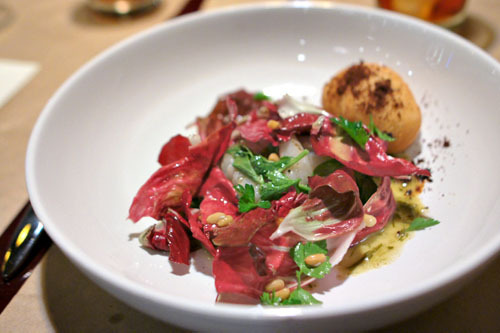 Even better was the radicchio(? 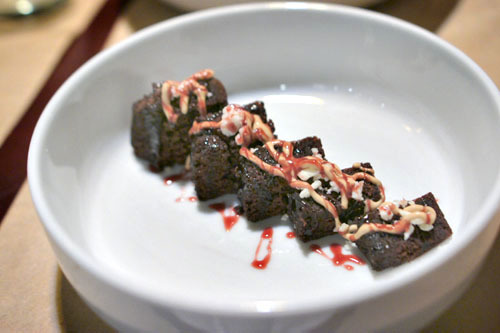 ), which did wonders as a contrast to the pudding, and I appreciated the small loaf of bread included as well. Nice crunch from the pine nuts, too. 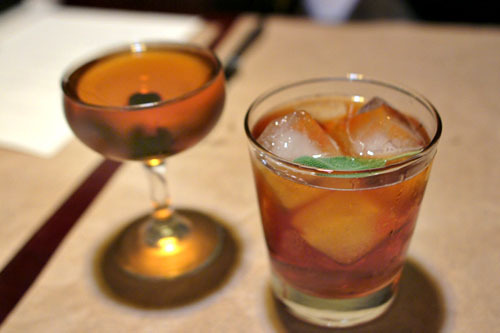 At Thompson's behest, Herrick sent out a special, off-menu whisky-based cocktail containing Famous Grouse, Amaro Averna, Angostura bitters, and orange. I loved the fragrant citrus nose on this one, along with the herb-y bitterness of the amaro and how the Scotch was so well integrated in the drink. A lot easier-drinking than it would appear. The Chef then gave us a new dish to try, one that he was still working on: a braised lamb neck with cinnamon, turnip, clove, apricot, harissa, kimchi crab, star anise, and pumpkin. 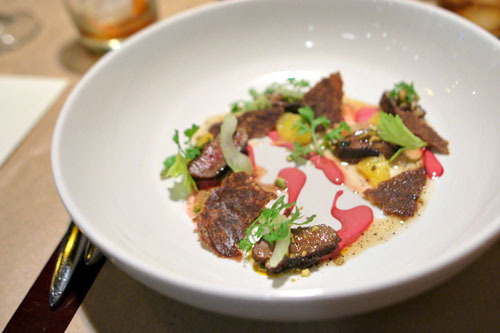 The meat, unsurprisingly, I found tender and quite "lamb-y," with a marked sweet spice to it. Radish was key in providing a contrasting bitterness to the dish, and also made for some great textural variation. My favorite thing here, though, was the harissa, which gave the dish a nice spicy kick. I would go a touch lighter on the clove and cinnamon, though. Given the gravity of some of the preceding courses, a salad of various veggies was a nice reprieve. 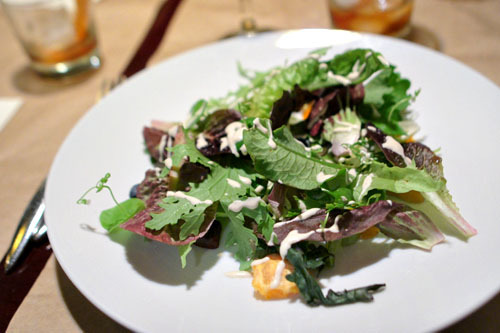 As the name of the course would imply, the bitterness of the lettuces was on proud display, a bracing, yet refreshing jolt of astringency that was duly moderated by the use of avocado and soy cream, while the tangerine added an apt sweetness on the finish. Squab arrived done up in Mediterranean garb. The meat itself I found tender, smoky, and imbued with a blast of sweet spice that was actually a bit overwhelming. The bird was somewhat lost amongst the heady flavors of baharat, date, and cinnamon, though the squab "chips" did help, providing a lip-smacking saltiness that brought things back to the savory side. Pork shoulder was delightful: fork-tender and utterly luxurious, with plenty of piggy goodness and a lovely sweetness from the caramelized onions, while the use of crosnes added further interest in each bite. 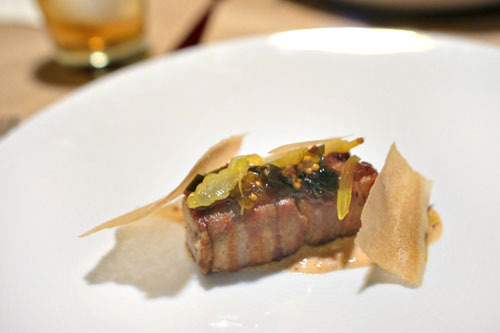 I also enjoyed the shards of feuille de brick and their contribution to the textural interplay of the dish. I'm no fan of carrots, but what Thompson did for this last savory course was pretty masterful. I loved how the root vegetables were presented in various facets and forms, each one adding something to the conversation of sweet, sour, bitter, salty, and spicy flavors. Our final cocktail brought us Le Système Solaire, a fine drink displaying the nutty, oxidative qualities of Sherry, augmented by the bittersweet, subtly herbal combination of the vermouth and bitters. Dessert time. 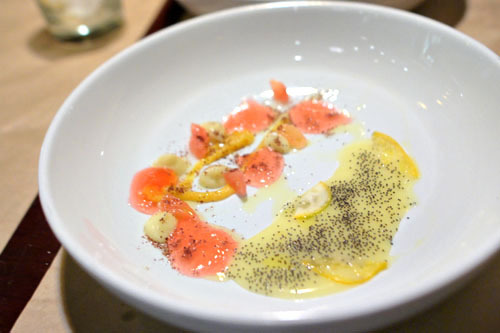 The citrus curd conveyed a balance of sweet and sour flavors, contrasted against the spice of poppy seeds, with the rose geranium overlaying a whisper of floral character to the dish. The rhubarb-lime jelly, I must caution, though, was quite bitter, and will probably be off-putting to some. Be warned. My favorite of the three desserts was this sort of reimagined cheesecake. The slight tanginess of the mousse paired well with the sweet, frozen dough, making for a sort of butter cookie-esque sensation, while the maple kicked up the sugariness level even further. The walnuts, meanwhile, offered up a nutty component to the plate, and also imparted a nice crunch to things. A comforting dessert, with a great "crust." We ended with a take on the classic red velvet cake, a "grown up" version according to my dining companion. Indeed, its sweetness was restrained, and instead gave us a palpable bitterness, amplified by the boozy notes from the Port and the soft astringency of coffee. A bit simplistic, but tasty. 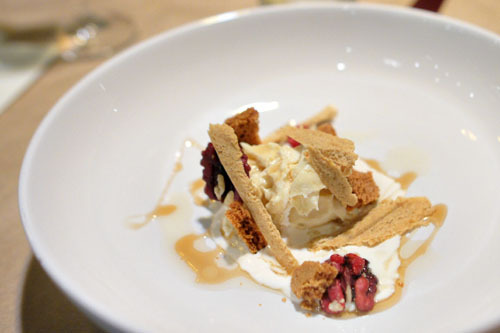 Compared to what he was serving at his pop-up, Thompson's cooking now seems to have matured. There's more subtlety at play, more finesse, though the ambitiousness and stimulating flavor combinations are still there. Overall, I liked the food even better this time around, and I think his cooking is going to get stronger and stronger and time goes on--remember, he's only 25. As for what's next, the Chef is planning to implement a tasting menu option in the coming months, so that's definitely something to return for. Vinh: Did you make it out here yet? Not yet, been busy with work and now I am sidelined for a bit. As soon as I am mobile I'll be sure to make the visit. Cynthia: Indeed. Why did you remove your previous comment? 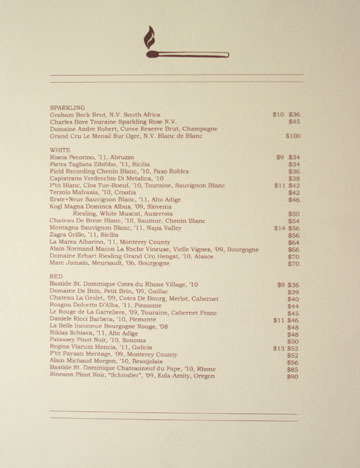 Any idea what the wine list is like or what corkage is at Allumette? 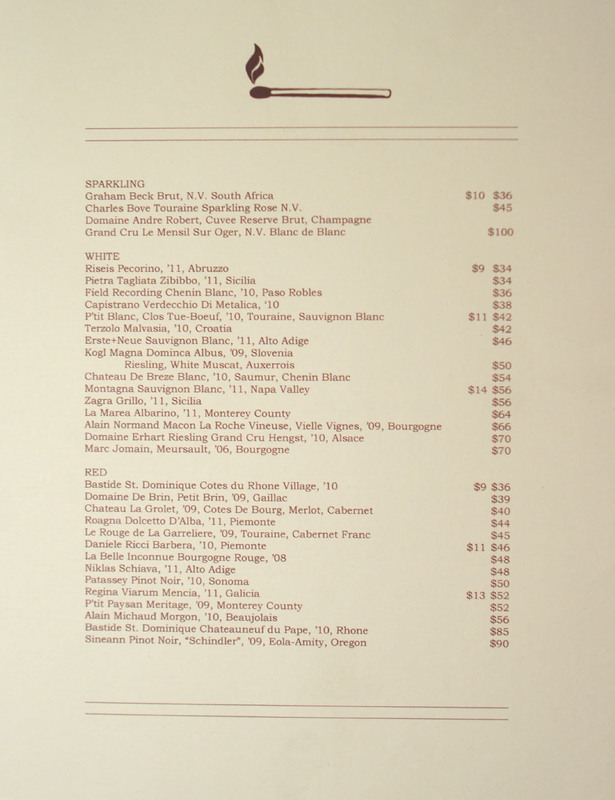 Anon: Not sure about corkage, but the wine list is posted above.